Liverpool striker Christian Benteke is ready to "run more" after having a "man conversation" with boss Jurgen Klopp. The Belgium international, 25, came off the bench to score the winner on Saturday and end Premier League leaders Leicester's three-month unbeaten run. "We had a 'man conversation' and I think it is going to help me and help the team," said Benteke, whose side visit Sunderland on Wednesday. "I have to run more and I have to be there for my team-mates." 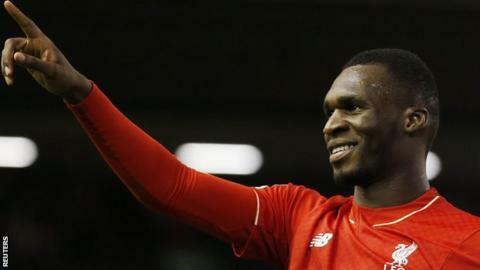 Benteke, a £32.5m signing from Aston Villa in July, started the first six matches of the season under Brendan Rodgers. But injury sidelined him for a month and by the time he returned Rodgers had been sacked and replaced by Klopp. He has yet to start back-to-back league matches under the German, with compatriot Divock Origi preferred up front in the starting line-up on Saturday. "I spoke with the manager a few days ago about where I can improve and what he is expecting from me," said Benteke, who has six goals in 18 appearances for the Reds. "Sometimes when you are a little bit on the side you try to understand what the manager needs and what he wants, and we had a very good chat. "You could see that I showed I understand his message and now I have to keep going like that." Team-mate Danny Ings has been ruled out for the season after a knee ligament operation and Daniel Sturridge has still not recovered from a hamstring problem. Now, with Origi struggling with a hamstring problem, Benteke is left as Liverpool's only fit frontline striker. "Of course I am still a young player and I want to learn," he said. "He is the right manager for me to help me in my development. "I am not saying every player can play like Barcelona but I have been in England a long time so I can adapt."